The Sunday Times of 29 Oct carried an article referring to Lord Naseby on demanding to remove the war crime tag from Sri Lanka. Lord Naseby researched classified documents to find that UN has fudged the casualty figure of 40,000 civilians killed during the last phase of warin Sri Lanka whereas it was a guess by the UN Panel of Experts (POE) better known as Darusman Commission. According to the classified documents filed by then British Defence Attaché in Colombo Lt. Col Anton Gash, the civilian killed from Feb 1 – 26 April 2009 is 6432. The figure could be higher with the civilian deaths occurred within next 3 weeks. However, the total civilian deaths are included civilians killed due to collateral damage during combat operations by the Armed Forces against LTTE, civilians killed intentionally by the LTTE by design and deaths of LTTE combatants dressed in civilian clothes. 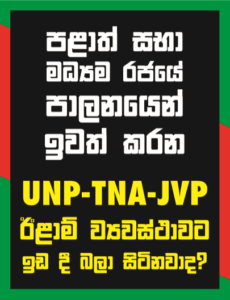 Therefore, it is important to critically analyse UN POE report to find out the truth for the government to build on Lord Naseby’s revealing to counter UNHRC report. The Executive Summary of the Darusman Report says that Around 330,000 persons were trapped in to an ever decreasing area, fleeing the shelling but kept hostage by the LTTE and Para 137 of the report says there could have been as many as 40,000 civilian deaths due to wide spread shelling by the government armed forces. I am not sure the source of 330,000 numbers and assume it should be the number of heads in Wanni Region for food requirement. If so the number includes LTTE cadreas well since Sri Lanka was the only country which fed terrorist while fighting them. POE, Para 99 says that “from beginning in Feb, LTTE commenced a policy of shooting civilians who attempted to escape and to this end cadre took up positions where they could spot civilians who might try to breakout”. POE, Para 112 says that “Some LTTE cadre would let fleeing civilians through, but others opened fire on them with AK-47s, killing men, women and children alike. The IDPs who attempted escape desperately tried to run away and to reach Sri Lanka Army lines, carrying their children or luggage or dropping them in their panic. Some were killed on the spot. Some children and others were drowned in the lagoon. While it is not known precisely how many people died this way, the number was significant and rose as the armed conflict progressed” POE, Para 119 says “Some civilians tried to stage a mass breakout but were shot and shelled by the LTTE. Those who managed to escape were helped across by individual Army soldiers”. Therefore, UN acknowledged that significant number of civilians were killed by LTTE.We can reasonably assumed that approximately 500 civilians were killed by LTTE. LTTE were holding civilians as a human shield and civilians wanted to escape to Army lines who helped them across the lagoon. The following are civilian deaths figures given by authorised reports. POE, Para 134 says that UN Country Team in a document which was never released publically estimated a total figure of 7,721 civilian killed from August 2008 up to 13 May 2009. The UN “Crisis Operation Group” which was formed to collect reliable information regarding civilian casualties took figures from Regional Directors of Health Services (RDHS) majority who were Tamil persons as the base line, Sri Lankan staff of UN who were deployed in Wanni again majority who were Tamil persons and NGOs deployed inside Vanni, the ICRC, religious authorities and other sources to cross check and verify the baseline. Therefore, the UN report should be 98% accurate. The census department is run by professionals whose work can be evaluated and assessed by other professionals. Anyone disagree with the department numbers can conduct a technical evaluation by an expert on numbers and methods. Therefore, we can safely conclude that total deaths which includecivilians killed by LTTE, civilians killed due to Army artilleryand LTTE cadre killed dressed in civil clothing would count to 7,721(UN figure) or 7,934. (Dept of Census & Statistics) which helps to arrive at an average figure of 7,828.”Fatalities in terrorist violence in Sri Lanka 2002- 2015″ reports that 3,139 LTTE cadre were killed in 2009″(South-Asia-Terrorism-Portal, 2009). However, only 1,346 individual graves were identified by satellite imagery. Therefore, 1,793 (3,139 – 1,346) LTTE cadre who got killed may have posed as civilians. According to POE 290,000 have emerged from the conflict zone. My calculation varies by +0.3% only. The ratio for Injuries to deaths is usually taken as 3:1 (and NOT 1:3 as assumed by POE). “The US casualties in Vietnam War was 153,303 injured and 58,209 killed”(Nese DeBruyne, 2015) in which the ratio is 3:1. According to POE 290,000 have emerged from the conflict zone. The UN has arrived at the figure of 40,000 as civilians killed by subtracting the number emerged from estimated population in Wanni. (330,000 – 290,000 = 40,000). The critical analysis of POE report shows that the civilians killed as a result of co-lateral damage is approximately 6,356 and not 40,000 as UN report fabricated. When an Army is fighting a war operating within civilian population and where civilians are killed it is a result incidental to the conduct of military operations. The New York Times in its 19 June publication says that the US led coalition air strikes have killed nearly 4,000 civilians in Syria. An average of 1,371 civilians killed per month in cross fire during the period of last 4 ½ months in a final stage of war is not a war crime. Immediately following the May 2009 defeat of the LTTE, Germany led resolution at the UNHCR against Sri Lanka ultimately ended up with a counter resolution favourable to Sri Lanka commending the nation for eliminating terrorism. This resolution confirms that LTTE kept civilians as hostages against their will and that the Government liberated almost 300,000 citizens kept by the LTTE. Now it is up to the GOSL to build on Lord Naseby’s findings and to present with a force the matters in correct perspective to international community and save the dignity of Sri Lankan Armed Forces.